Yes - I want to learn how to supercharge my lead pipeline. If only this was the case for your website. Simply having a pretty website isn’t enough anymore. You need to develop targeted strategies for driving traffic to your site and converting that traffic to qualified leads. If your website isn’t generating any or enough leads, rest assured that it can. 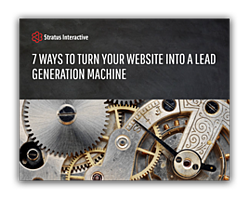 Our new guide, “7 Ways To Turn Your Website Into A Lead Generation Machine,” will help you supercharge your lead pipeline. Just fill out the form and download your free copy today.